Washington (CNN) – Texas Rep. Ron Paul is expected to announce Friday that he will seek the Republican presidential nomination, a source close to the campaign tells CNN. Paul will hold a morning campaign event in Exeter, New Hampshire where he is expected to receive several endorsements. This is Paul's third bid for the White House. He ran as the Libertarian Party nominee in 1988 and sought the GOP nomination in 2008. Libertarianism is an assignment in the CNN iReport community - offer your thoughts. Hey "Democrat Class Warfare – Destroying the economy, destroying the country", the only "dolts" we have now are those mindless twigs like you that do your uber-partisan, drive-by verbal attacks on our fine president with NOTHING to backup your criticisms. You and your mindless hacks wouldn't know a good presidential candidate if he/she crapped on your head. You proved that in 2000 and 2004 when you set in motion the abject [R] FAILURE that this fine country of ours is still trying to recover from. You are an empty Teatard. He is certainly within his rights to do so, but what a waste of time and resources! Wait a minute, you mean someone is running for President that comes without personal scandal and is knowledgeable in both foreign policy and the economy....this is so crazy it just might work. Yes!!! If Ron Paul wins he promised to eliminate the IRS, the Department of Education, the Federal Reserve, the FBI, the CIA, maybe the military. We will all be absolutely free to roam our devastated and lawless country with our weapons and battle with others for supremacy over scarce resources such as food and water. "VOTE FOR RON PAUL AND YOU WON'T NEED YOUR X-BOX"
Paul is a joke. He should run as a libertarian because he is definitely not a conservative. Ron would be an excellent President. He has Great Econimical views along with values and wants to put Americans first. Lets be "Proud" to be an American for the first time in 4 years – Vote for Ron Paul! Ron Paul is nothing more than a scrawny Michael Moore, but doesn't want to spend a dime of federal money...except of course on HIS Pet Pork barrel projects. A paul/johnson ticket would do wonders to finally bring some common sense to washington and fix the problem my dad and grandfathers generation left for me to pick up. I wish people would take the media filter away and just listen to the message. Too often we take what taliking heads think and chalk it up as truth rather than listening to the actual person. This man good or bad is intelectually honest. He is not some typical politician who runs on what he thinks the people want to hear but runs on what he truly believes. Obama has done little but continue many of the Bush policies/ wars that he railed against. Paul was anti-war in the Republican party, anti-Patriot Act, and promotes an actual clear headed solution to many of the economic and social welfair problems that plague are nation and government. He gets praised and attacked by both sides. I think that speaks to the courage of his convictions. Take a few minutes out of your day and look him up on youtube. Listen to his words and make your own mind up. 100 % right. It just blows my mind at how many people who blog on this site still don't get it. The only hope this country has is with the Democrats and they better wake up soon. This clown parade of unlikely, unelectable and totally unserious candidates is really pretty insulting. What has been insulting and destructive was the election of the current clown, an inexperienced community organizer controlled by union thugs. 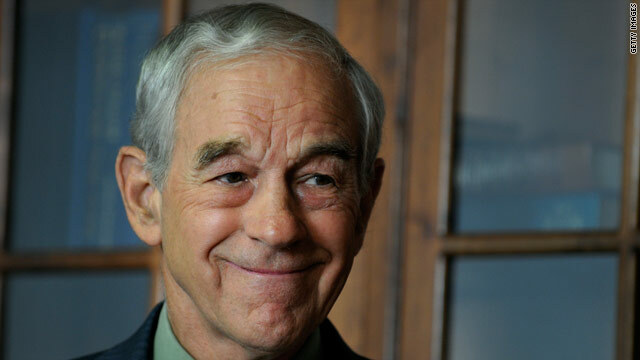 Ron Paul to waste more money to spread his insanity. With you all the way Dr. Paul. He's not as horrible as the other republican candidates, but I'm not sure that's enough to win an election. This man will run until the time he is not able to lift his leg up and move. Ron Paul will NOT win the nomination and will never be President. Sarah Palin will easily PWN him in the primaries and she will be president for 8 great years. Palin's inevitable victory will ensure that men, minorities and liberals will NEVER be president again! Every President and Vice-President from Sarah Palin onwards will be conservative white women. We will have an eternal line of conservative white women presidents and vice-presidents. Congratulations and I hope that all goes well. I am a big fan of Obama however I wish you all the best. It is always good to know your competition. Its bad when they know you but you don't know them. I mean there is still two years and Donald Trump wants that same seat. Very exciting to see how all this will become. It's pretty amazing how many of you slander him yet have no idea how much worse nearly every single candidate is. I'm not even American, so I can't change the outcome and it probably won't affect me too much. But seriously – pull your heads out and vote him in. You're ruined and excluding people like Kucinich, nobody else is electable. Of course you probably wouldn't know this because you're all so hung up looking at the red and blue donkeys and elephants that you don't bother to read policy and instead vote for the name you recognise. So don't vote him in and enjoy the continuing downward spiral that even your hero, Obama, has also contributed to.